Called “The Great War” and more optimistically “The War to End All Wars,” World War I was an event that changed the world’s political map and the fabric of civilization. One hundred years ago, more than 17 million people perished, and this unprecedented bloodshed was accompanied by social upheaval and revolution as ancient empires crumbled and new nations were established. 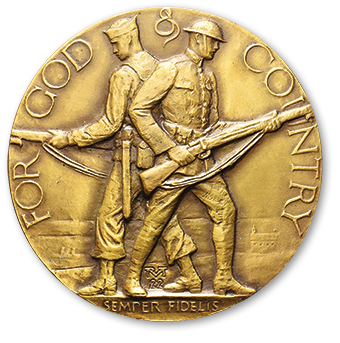 This exhibit uses money and medals to illustrate the events and effects of World War I politically, economically and socially. The initial combatants were Germany, Austria-Hungary and the Ottoman Empire as the Central Powers; and Montenegro, Serbia, Russia, France, Japan, Belgium and Great Britain as the Entente. The war grew to encompass nations from across the globe, with battlefields in Europe, Asia, Africa, the Pacific and most of the world’s seaways. Warfare was industrialized with horrific new weapons while propaganda campaigns ensured that civilians supported the war no matter what the cost. Eastern Europe was destabilized — the Habsburg and Russian Empires collapsed, and left civil war and anarchy in their wake. The new order in Eastern Europe was even more brutal and oppressive than the old. In Western Europe, Great Britain and France were weakened and Germany was crippled and resentful — setting the stage for World War II. The collapse of the Ottoman Empire resulted in the redrawing of the Middle Eastern map with consequences still relevant today. Economically, the war caused the collapse of the gold standard, which had done much to create the prewar era of international trade and economic expansion. Free trade was replaced by protectionism and international trade took over 80 years to recover as a percentage of global economic prosperity. The entry of the United States into World War I in April of 1917 on the side of the Entente was decisive. American industry and agriculture ensured that Great Britain and France could continue to fight in spite of German successes, and American manpower eventually overpowered the German armies on the Western Front. Meanwhile, the U.S. replaced Britain as the world’s banker, becoming the greatest financial power on earth. These were just a few of the consequences of the shots fired by a young Bosnian-Serb nationalist in Sarajevo on June 28, 1914. Click below on the exhibit case that you would like to view. More cases will be added periodically.